Please keep in mind prices do not include any travel or out of state fee's. Dates fill up fast! Be sure to submit your reservation request ahead of time. Add a Petting Zoo & Get a Discount! $175- add pony (or donkey) to a non-trailer program. 4 Pony Carousel: Our traditional carousel has a weight limit of 115 lbs. Minimum cost: $900 for up to 3 hours. $200 for each additional hour. 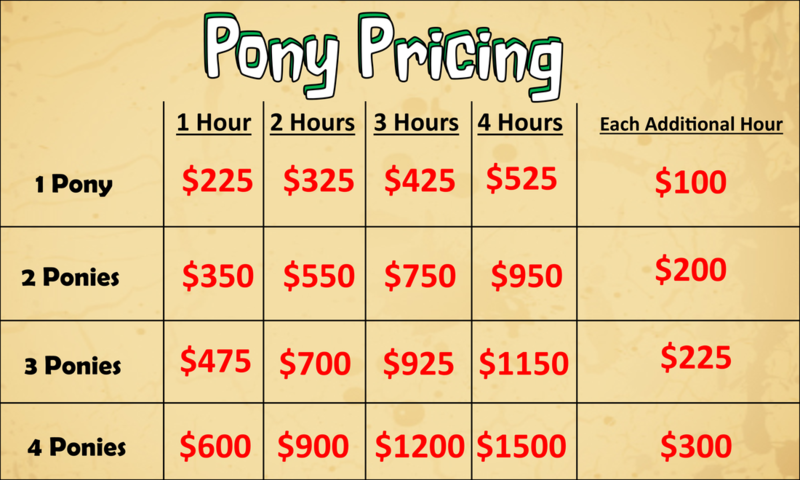 6 Pony Carousel: Minimum Cost: $1200 for up to 3 hours. $300 for each additional hour. $75 Unicorn Rides: The cutest Unicorns around!! Lots of dazzle, glitter, shimmering horn, flowers, and more! $50 Princess Pony: Pony is dressed up with bows, flowers, and glitter! $50 Cowboy Pony: Pony is dressed up with bandannas and a cowboy hat is brought along for the children to wear while riding! $50 My Little Pony: Pony has a painted mane and tail. Pink, purple, or green, are colors to go along with your favorite little pony or party theme! A few bows and braids are also in place to make her look extra cute! $75 Fairy tale Pony: Pony is decked out with bows, braids, glitter, flowers, and even a few butterflies! Plus the pony has a colorful painted mane and tail. $50 A Knights Pony: Pony is dressed for the best of knights!! Pony comes with traditional body covering and head covering.